Chronic myelogenous (or myeloid or myelocytic) leukemia (CML), also known as chronic granulocytic leukemia (CGL), is a cancer of the white blood cells. It is a form of leukemia characterized by the increased and unregulated growth of predominantly myeloid cells in the bone marrow and the accumulation of these cells in the blood. 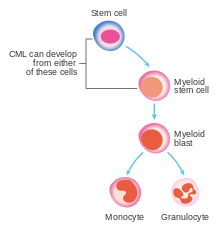 CML is a clonal bone marrow stem cell disorder in which a proliferation of mature granulocytes (neutrophils, eosinophils and basophils) and their precursors is found. It is a type of myeloproliferative disease associated with a characteristic chromosomal translocation called the Philadelphia chromosome. CML is now largely treated with targeted drugs called tyrosine kinase inhibitors (TKIs) which have led to dramatically improved long-term survival rates since the introduction of the first such agent in 2001. These drugs have revolutionized treatment of this disease and allow most patients to have a good quality of life when compared to the former chemotherapy drugs. In Western countries, CML accounts for 15-20% of all adult leukemias and 14% of leukemias overall (including the pediatric population). Most patients (~90%) are diagnosed during the chronic stage which is most often asymptomatic. In these cases it may be diagnosed incidentally with an elevated white blood cell count on a routine laboratory test. It can also present with symptoms indicative of Hepatosplenomegally and the resulting upper quadrant pain this causes. The enlarged spleen may put pressure on the stomach causing a loss of appetite and resulting weight loss. It may also present with mild fever and night sweats due to an elevated basal level of metabolism. CML is more common in males than in females (male to female ratio of 1.4:1) and appears more commonly in the elderly with a median age at diagnosis of 65 years. Exposure to ionising radiation appears to be a risk factor, based on a 50 fold higher incidence of CML in Hiroshima and Nagasaki nuclear bombing survivors. The rate of CML in these individuals seems to peak about 10 years after the exposure. Approximately 85% of patients with CML are in the chronic phase at the time of diagnosis. During this phase, patients are usually asymptomatic or have only mild symptoms of fatigue, left side pain, joint and/or hip pain, or abdominal fullness. The duration of chronic phase is variable and depends on how early the disease was diagnosed as well as the therapies used. In the absence of treatment, the disease progresses to an accelerated phase. Precise patient staging based on clinical markers and personal genomic profile will likely prove beneficial in the assessment of disease history with respect to progression risk. The only curative treatment for CML is a bone marrow transplant or an allogeneic stem cell transplant. Other than this there are four major mainstays of treatment in CML: treatment with tyrosine kinase inhibitors, myelosuppressive or leukopheresis therapy (to counteract the leukocytosis during early treatment), splenectomy and interferon alfa-2b treatment. Due to the high median age of patients with CML it is relatively rare for CML to be seen in pregnant women, despite this, however, chronic myelogenous leukemia can be treated with relative safety at any time during pregnancy with Interferon-alpha hormones. In the past, antimetabolites (e.g., cytarabine, hydroxyurea), alkylating agents, interferon alfa 2b, and steroids were used as treatments of CML in the chronic phase, but since the 2000s have been replaced by Bcr-Abl tyrosine-kinase inhibitors drugs that specifically target BCR-ABL, the constitutively activated tyrosine kinase fusion protein caused by the Philadelphia chromosome translocation. Despite the move to replacing cytotoxic antineoplastics (standard anticancer drugs) with tyrosine kinase inhibitors sometimes hydroxyurea is still used to counteract the high WBCs encountered during treatment with tyrosine kinase inhibitors like imatinib; in these situations it may be the preferred myelosuppressive agent due to its relative lack of leukemogenic effects and hence the relative lack of potential for secondary hematologic malignancies to result from treatment. IRIS, an international study that compared interferon/cytarabine combination and the first of these new drugs imatinib, with long-term follow up, demonstrated the clear superiority of tyrosine-kinase-targeted inhibition over existing treatments. To overcome imatinib resistance and to increase responsiveness to TK inhibitors, four novel agents were later developed. The first, dasatinib, blocks several further oncogenic proteins, in addition to more potent inhibition of the BCR-ABL protein, and was initially approved in 2007 by the US FDA to treat CML in patients who were either resistant to or intolerant of imatinib. A second new TK inhibitor, nilotinib, was also approved by the FDA for the same indication. In 2010, nilotinib and dasatinib were also approved for first-line therapy, making three drugs in this class available for treatment of newly diagnosed CML. In 2012, Radotinib joined the class of novel agents in the inhibition of the BCR-ABL protein and was approved in South Korea for patients resistant to or intolerant of imatinib. Bosutinib received US FDA and EU European Medicines Agency approval on September 4, 2012 and 27 March 2013 respectively for the treatment of adult patients with Philadelphia chromosome-positive (Ph+) chronic myelogenous leukemia (CML) with resistance, or intolerance to prior therapy. A 2011 followup of 832 patients using imatinib who achieved a stable cytogenetic response found an overall survival rate of 95.2% after 8 years, which is similar to the rate in the general population. Fewer than 1% of patients died because of leukemia progression. 1 2 Besa, EC; Buehler, B; Markman, M; Sacher, RA (27 December 2013). Krishnan, K, ed. 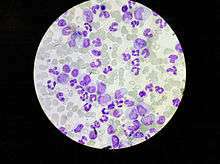 "Chronic Myelogenous Leukemia". Medscape Reference. WebMD. Retrieved 3 January 2014. 1 2 3 4 5 Besa, EC; Buehler, B; Markman, M; Sacher, RA (27 December 2013). Krishnan, K, ed. "Chronic Myelogenous Leukemia Clinical Presentation". Medscape Reference. WebMD. Retrieved 3 January 2014. 1 2 3 4 Provan, D; Gribben, JG (2010). "Chapter 7 Chronic myelogenous leukemia". Molecular Hematology (3rd ed.). Singapore: Wiley-Blackwell. p. 76. ISBN 9781444318548. ↑ Rowley JD (2013). "Genetics. A story of swapped ends". Science. 340: 1412–1413. doi:10.1126/science.1241318. 1 2 3 4 5 Tefferi A (2006). "Classification, diagnosis and management of myeloproliferative disorders in the JAK2V617F era". Hematology / the Education Program of the American Society of Hematology. American Society of Hematology. Education Program. 2006: 240–5. doi:10.1182/asheducation-2006.1.240. PMID 17124067. ↑ Savage DG, Szydlo RM, Goldman JM (Jan 1997). "Clinical features at diagnosis in 430 patients with chronic myeloid leukaemia seen at a referral centre over a 16-year period". British Journal of Haematology. 96 (1): 111–6. doi:10.1046/j.1365-2141.1997.d01-1982.x. PMID 9012696. 1 2 3 Tefferi A, Thiele J, Orazi A, Kvasnicka HM, Barbui T, Hanson CA, Barosi G, Verstovsek S, Birgegard G, Mesa R, Reilly JT, Gisslinger H, Vannucchi AM, Cervantes F, Finazzi G, Hoffman R, Gilliland DG, Bloomfield CD, Vardiman JW (Aug 2007). "Proposals and rationale for revision of the World Health Organization diagnostic criteria for polycythemia vera, essential thrombocythemia, and primary myelofibrosis: recommendations from an ad hoc international expert panel". Blood. 110 (4): 1092–7. doi:10.1182/blood-2007-04-083501. PMID 17488875. ↑ Nowell PC (Aug 2007). "Discovery of the Philadelphia chromosome: a personal perspective". The Journal of Clinical Investigation. 117 (8): 2033–5. doi:10.1172/JCI31771. PMC 1934591 . PMID 17671636. 1 2 Faderl S, Talpaz M, Estrov Z, Kantarjian HM (Aug 1999). "Chronic myelogenous leukemia: biology and therapy". Annals of Internal Medicine. 131 (3): 207–219. doi:10.7326/0003-4819-131-3-199908030-00008. PMID 10428738. 1 2 Hehlmann R, Hochhaus A, Baccarani M (Jul 2007). "Chronic myeloid leukaemia". Lancet. 370 (9584): 342–50. doi:10.1016/S0140-6736(07)61165-9. PMID 17662883. ↑ Brehme M, Koschmieder S, Montazeri M, Copland M, Oehler VG, Radich JP, Bruemmendorf TH, Schuppert A (2016). "Combined population dynamics and entropy modelling supports patient stratification in chronic myeloid leukemia". Sci Rep. 6: 24057. doi:10.1038/srep24057. PMC 4822142 . PMID 27048866. ↑ Kantarjian HM, Dixon D, Keating MJ, Talpaz M, Walters RS, McCredie KB, Freireich EJ (Apr 1988). "Characteristics of accelerated disease in chronic myelogenous leukemia". Cancer. 61 (7): 1441–6. doi:10.1002/1097-0142(19880401)61:7<1441::AID-CNCR2820610727>3.0.CO;2-C. PMID 3162181. ↑ Sokal JE, Baccarani M, Russo D, Tura S (Jan 1988). "Staging and prognosis in chronic myelogenous leukemia". Seminars in Hematology. 25 (1): 49–61. PMID 3279515. ↑ Vardiman JW, Harris NL, Brunning RD (Oct 2002). "The World Health Organization (WHO) classification of the myeloid neoplasms". Blood. 100 (7): 2292–302. doi:10.1182/blood-2002-04-1199. PMID 12239137. ↑ Karbasian Esfahani M, Morris EL, Dutcher JP, Wiernik PH (May 2006). 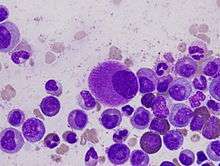 "Blastic phase of chronic myelogenous leukemia". Current Treatment Options in Oncology. 7 (3): 189–199. doi:10.1007/s11864-006-0012-y. PMID 16615875. 1 2 Besa, EC; Buehler, B; Markman, M; Sacher, RA (27 December 2013). Krishnan, K, ed. "Chronic Myelogenous Leukemia Treatment & Management". Medscape Reference. WebMD. Retrieved 4 January 2014. ↑ Shapira T, Pereg D, Lishner M (Sep 2008). "How I treat acute and chronic leukemia in pregnancy". Blood Reviews. 22 (5): 247–59. doi:10.1016/j.blre.2008.03.006. PMID 18472198. ↑ Besa, EC; Buehler, B; Markman, M; Sacher, RA (27 December 2013). Krishnan, K, ed. "Chronic Myelogenous Leukemia". Medscape Reference. WebMD. Retrieved 3 January 2014. ↑ DeAngelo DJ, Ritz J (Jan 2004). "Imatinib therapy for patients with chronic myelogenous leukemia: are patients living longer?" (PDF). Clinical Cancer Research. 10 (1 Pt 1): 1–3. doi:10.1158/1078-0432.CCR-1218-3. PMID 14734443. 1 2 Gambacorti-Passerini C, Antolini L, Mahon FX, Guilhot F, Deininger M, Fava C, Nagler A, Della Casa CM, Morra E, Abruzzese E, D'Emilio A, Stagno F, le Coutre P, Hurtado-Monroy R, Santini V, Martino B, Pane F, Piccin A, Giraldo P, Assouline S, Durosinmi MA, Leeksma O, Pogliani EM, Puttini M, Jang E, Reiffers J, Valsecchi MG, Kim DW (Apr 2011). "Multicenter independent assessment of outcomes in chronic myeloid leukemia patients treated with imatinib". Journal of the National Cancer Institute. 103 (7): 553–561. doi:10.1093/jnci/djr060. PMID 21422402. ↑ Jabbour E, Cortes JE, Giles FJ, O'Brien S, Kantarjian HM (Jun 2007). "Current and emerging treatment options in chronic myeloid leukemia". Cancer. 109 (11): 2171–2181. doi:10.1002/cncr.22661. PMID 17431887. ↑ Kimura S, Ashihara E, Maekawa T (Oct 2006). "New tyrosine kinase inhibitors in the treatment of chronic myeloid leukemia". Current Pharmaceutical Biotechnology. 7 (5): 371–379. doi:10.2174/138920106778521532. PMID 17076652. ↑ Bocchia M, Gentili S, Abruzzese E, Fanelli A, Iuliano F, Tabilio A, Amabile M, Forconi F, Gozzetti A, Raspadori D, Amadori S, Lauria F (2005). "Effect of a p210 multipeptide vaccine associated with imatinib or interferon in patients with chronic myeloid leukaemia and persistent residual disease: a multicentre observational trial". Lancet. 365 (9460): 657–662. doi:10.1016/S0140-6736(05)17945-8. PMID 15721470. ↑ Druker BJ, Guilhot F, O'Brien SG, Gathmann I, Kantarjian H, Gattermann N, Deininger MW, Silver RT, Goldman JM, Stone RM, Cervantes F, Hochhaus A, Powell BL, Gabrilove JL, Rousselot P, Reiffers J, Cornelissen JJ, Hughes T, Agis H, Fischer T, Verhoef G, Shepherd J, Saglio G, Gratwohl A, Nielsen JL, Radich JP, Simonsson B, Taylor K, Baccarani M, So C, Letvak L, Larson RA (Dec 2006). "Five-year follow-up of patients receiving imatinib for chronic myeloid leukemia". The New England Journal of Medicine. 355 (23): 2408–17. doi:10.1056/NEJMoa062867. PMID 17151364. ↑ "Chronic myeloid leukaemia (CML) statistics". Cancer Research UK. Retrieved 28 October 2014. ↑ "What are the key statistics about chronic myeloid leukemia?". www.cancer.org. American Cancer Society. Retrieved 6 January 2015.